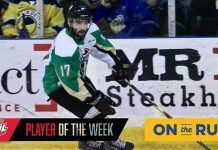 Adam Helewka netted eight points (6g-2a) last week. Calgary, AB – The Western Hockey League announced today that Red Deer Rebels forward Adam Helewka has been named the WHL Player of the Week for the week ending January 10th, 2016. Helewka recorded eight points (6g-2a) to go along with a plus-7 rating in four games to lead the Red Deer Rebels to a record of 2-0-1-1 for the week. 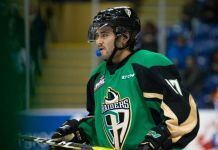 On Tuesday, January 5th against the Prince Albert Raiders, Helewka scored the game-winning goal as the Rebels defeated the Raiders by a score of 4-3. The following night, Helewka recorded three points (1g-2a) to lead the Rebels to a 5-0 shutout victory against the Saskatoon Blades. On Friday, January 8th, Helewka was named the game’s first star and scored the game-tying goal in the third period as the Rebels fell to the Hurricanes in a shootout. 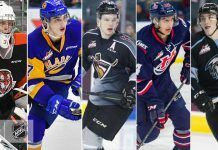 The following night, Helewka capped off an impressive week with another first-star performance as he netted a hat trick in the Rebels’ overtime loss to the Vancouver Giants. The 20-year-old Burnaby, BC native has collected 41 points (23g-18a) in 24 total games so far this season, with 12 (7g-5a) coming in five games since being acquired by Red Deer from Spokane. The 6-2, 200 lb forward is in his fourth WHL campaign and has amassed 205 points (100g-105a) in 215 career WHL regular season contests. Helewka was selected by the San Jose Sharks in the fourth round of the 2015 NHL Draft. The WHL has also nominated Landon Bow of the Seattle Thunderbirds for the Vaughn CHL Goaltender of the Week award. Bow, a 1995-born netminder from St. Albert, AB, wasted little time with Seattle after being acquired from Swift Current. Bow posted a pair of wins with a 1.49 goals against average and a .946 save percentage in his first two games with the club last week. Currently in his fourth WHL season, Bow has amassed a 60-50-8-5 record with a career 3.09 goals against average and .909 save percentage. Bow has 10 career shutouts to his credit, nine of which have come over the past two seasons.